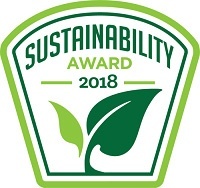 This award recognizes a collaboration between Barclays and sustainability software leader Greenstone to develop a new software solution to facilitate the monitoring and reporting of initiatives to reduce environmental impacts across energy, water, waste and paper. This new solution enables organizations to define targets, analyze how projects are contributing towards them and identify projects that could provide CO2e and consumption savings. It can also be used to enable Monitoring and Verification (M&V) calculations to assess actual project savings. In addition to demonstrating leadership in product innovation, this project is an example of how Barclays is leading best practice and investing in helping other companies to achieve their environmental goals. Once completed, this innovative solution was made available to other organizations enabling them to similarly track, monitor and report consumption, carbon and financial savings from the implemented environmental initiatives. “We are delighted that we have been externally recognized. At Barclays we are continually striving to build partnerships to enable and share technology innovation and by working with Greenstone we have been able to advance our own environmental goals and enable other companies to do the same”. For further information about Barclays, please visit our website http://www.home.barclays.